In Maricopa County, in Scottsdale, Arizona, you’ll find a beautiful community known as McDowell Mountain Ranch. McDowell Mountain Ranch is nestled along the southwestern flank of the McDowell Mountains between Union Hills Road and Taliesin. McDowell Mountain Ranch is set apart from other parts of Scottsdale by the Central Arizona Project Dike and detention area to the south and the mountains to the east. Its location affords residents of this picturesque community a peaceful, laid-back lifestyle with quick and easy access to the amenities of the city. McDowell Mountain Ranch is an award-winning 3,200 acre master-planned community. With miles of trails, a beautiful 5 acre park, and multiple children’s playgrounds, McDowell Mountain Ranch is a great place to raise a family. Other community features include 2 heated pools and spas, and tennis, beach volleyball and basketball courts. This remarkable community is only 2 minutes away from the Westworld equestrian center. 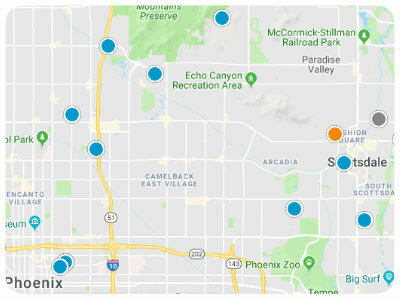 Also in close proximity you’ll find Desert Canyon Elementary and Middle schools, the Scottsdale Arabian Library and the City of Scottsdale Aquatic Center. In addition to all of that there are also two shopping centers nearby with great dining and shopping options. McDowell Mountain Ranch was developed between 19987 and 2003 and is composed of around 4,000 homes in 26 distinct neighborhoods. Within McDowell Mountain Ranch you’ll find condos, townhomes, patio homes, hill-side custom homes, acreages, detached single family homes and everything in between. Some of the McDowell Mountain Ranch communities are gated and guard-gated, and homes for sale in the area vary in price depending upon the property’s size, style, location and special features. The community also boasts its own golf course and a location just 5 minutes from the Loop 101 Freeway, 7 minutes from the Scottsdale Airport and 25 minutes from Phoenix’s Sky Harbor International Airport. If you would like to buy a home for sale in McDowell Mountain Ranch of Scottsdale, Arizona, please feel free to contact us today for more information.